Less than 24 hours after the Men's triathlon event in Rio, I've been able to sit down and look through some of the great images from the race, courtesy of the ITU Media team, and their on course photographers Delly Carr and Janos M. Schmidt. Already this morning (click HERE for more), I've written about what I personally think could be one of the images of the Olympic Games. Honestly, it is amazing. Here, I take a look back at how the race evolved, in pictures. Enjoy. Unlike the majority of ITU World Triathlon Series races, it was a beach start in Rio. By coincidence, Alistair, Jonathan and Henri started next to each other on the first three positions from right to left on the beach starting positions. Had anyone predicted the 1/2/3 at that stage?! There have been lots of empty seats in the stadiums - but the streets of Rio and Copacobana were busy today. The damage was done immediately on the bike. With the Brownlee's among those pushing the pace, an early break of ten was created. Aware of the threat of Mario Mola (ESP) and Richard Murray (RSA), the Brownlee's would have been thrilled to create a leading group with both behind, building that advantage to over a minute by T2. The lead group passing through transition at the end of the bike lap. Despite the efforts of Mola, Bummenfelt, Murray and others, the Brownlee group would not be caught. A focussed looking Jonathan Brownlee on the climb. With the bike safely out of the way - and no penalties to serve - it would be all about who had their running legs. 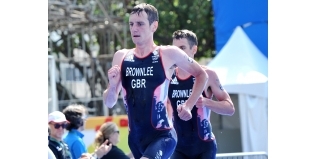 It was quickly a Brownlee one-two at the front during the 10km run. Never previously on a World Triathlon Series podium, Henri Schoeman (RSA) passed Vincent Luis, moved into third place and had an Olympic podium finish in his sights. Lawrence Fanous is a familiar sight in the UK. He was the first athlete to represent Jordan in the Olympic Games triathlon. Ireland's Bryan Keane has had to fight back from a shattered kneecap to reach his first Olympic Games. Alistair was very diligent all day in terms of pacing, hydration and cooling. I think we can safely say he was happy. That's not a bad view to have. All smiles on the podium. A great day for Great Britain and a breakthrough result for Henri Schoeman.